In these difficult for so many people times, every happy ending story or a motivational flicker of hope is welcomed to warm the disappointed heart. In my opinion, when it comes to animals around us, you can’t find truer of more natural motivators of the human spirit. And, every bird owner swears there is that one song, one sound their bird makes that renders them forgetful of all their troubles with its simple beauty. They remind us how to be human again. We all experienced it. We all felt it. 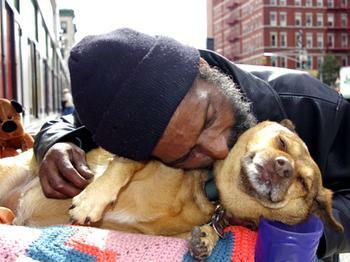 But, the story I wanted to relate today is that of hope given to a homeless man by a homeless dog, and vice versa. From one unlikely foster to another.